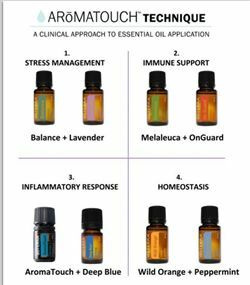 I am excited to announce I am now Certified in doTERRA’s AromaTouch Technique! I am offering introductory pricing through the end of July! The technique was created to combat four systemic constants: stress, toxic insult, inflammation, and autonomic imbalance. Recognizing that there are common factors at the foundation of illness in the body, the AromaTouch Technique was developed to reduce these systemic constants and return the body to a state of system balance. AromaTouch Technique – What It Does! If we can reach a state of Homeostasis our bodies will heal themselves. Call 970-390-0649 or email me today lisa(at)lisabova.com for an appointment. ← Free full length film of Fat, Sick and Nearly Dead, until June 20th.